Happy Friday friends! This week was a harsh reality check after getting back to school from Spring Break (Would anyone want to see pictures from my Montreal trip?). I am SO grateful that its finally Friday, the weather is finally getting warmer, and for the fun plans I have with my friends this weekend! Some of you may know that I do work for a local Richmond boutique called Mod&Soul! If you live in Richmond then you should make a point to stop by the store soon - the new arrivals are SO GOOD (think whites, blues, and stripes)! The owner is super lovely and has a great eye for trends and styles! I write for the blog and occasionally help them out by modeling for social media content. We had some very random warm days at the end of February and beginning of March so it was great that we could shoot some of the warmer weather pieces. I didn't want to share it with you since its not technically Spring yet (who got hit by the blizzard) but with the warm sunshine that we have today, I couldn't wait to share. 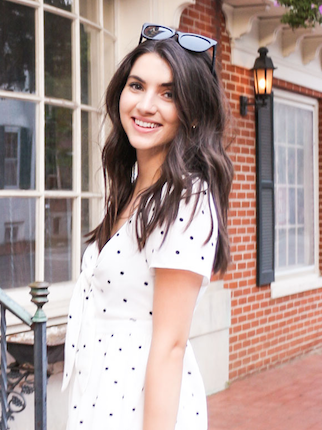 When it comes to Spring clothes, my color palate usually doesn't stray far from whites, blues, and pink - and if it's striped then I love it even more! This powder blue and navy striped dress is everything I couldn't want and more in a Spring dress! The fabric is light and airy and the shape is super flattering! I wore them with my favorite gold sneaks for an easy daytime look! Check out Mod&Soul's blog for more of my blog posts and outfits! Check out this post to see more pictures of the dress! That dress is adorable!!!!! Such a fresh and sharp look for spring, love it!